Public school teachers are among the most underpaid workers, given their workload and role in the society. Despite the fact that they are heralded as molders of our children’s future and second parents to our children, public school teachers receive a basic salary that does not equate to their contribution. Our teachers are considered to be the heart of the educational system. Hence, the government needs to give priority to their welfare and interests. The low salaries received by our public school teachers have been a major disincentive for them to improve their skills in teaching and pursue further education and training. More so, our public schools have failed to attract the best and the brightest graduates from the top colleges and universities because of low salary levels, preventing our public education system from benefiting from the knowledge and expertise of outstanding teachers. Especially with the recent implementation of the K-12 law, having inspired and capable teachers is probably one of the best investments our government could make. 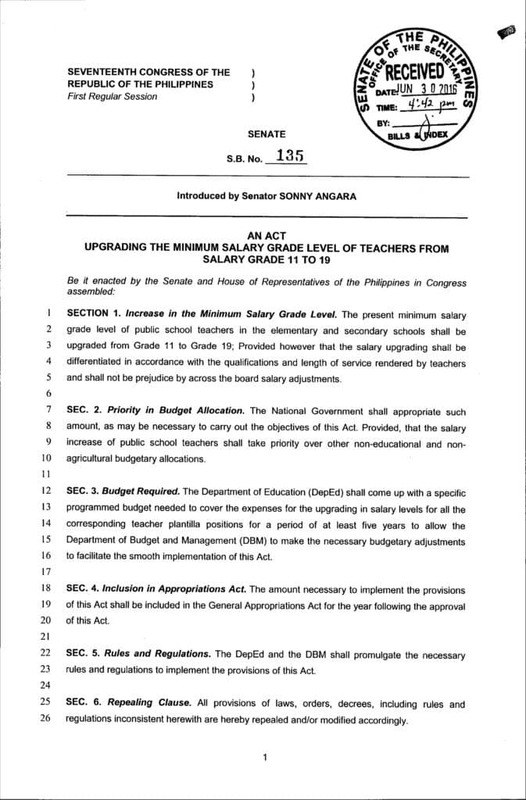 In this regard, this bill seeks to raise the minimum salary grade level of teachers from the current Salary Grade 11 to 19. With this increase in salaries, more qualified and competent educators will be attracted to teach in public schools. Definitely, this will greatly help in motivating our teachers to strive for excellence in their field and thus, improve the quality of education in the public school system. SECTION 1. Increase in the Minimum Salary Grade Level. The present minimum salary grade level of public school teachers in the elementary and secondary schools shall be upgraded from Grade 11 to Grade 19; Provided however that the salary upgrading shall be differentiated in accordance with the qualifications and length of service rendered by teachers and shall not be prejudice by across the board salary adjustments. SEC. 2. Priority in Budget Allocation. The National Government shall appropriate such amount, as may be necessary to carry out the objectives of this Act. Provided, that the salary increase of public school teachers shall take priority over other non-educational and non-agricultural budgetary allocations. SEC. 3. Budget Required. The Department of Education (DepEd) shall come up with a specific programmed budget needed to cover the expenses for the upgrading in salary levels for all the corresponding teacher plantilla positions for a period of at least five years to allow the Department of Budget and Management (DBM) to make the necessary budgetary adjustments to facilitate the smooth implementation of this Act. SEC. 4. Inclusion in Appropriations Act. The amount necessary to implement the provisions of this Act shall be included in the General Appropriations Act for the year following the approval of this Act. SEC. 5. Rules and Regulations. The DepEd and the DBM shall promulgate the necessary rules and regulations to implement the provisions of this Act. SEC. 6. Repealing Clause. All provisions of laws, orders, decrees, including rules and regulations inconsistent herewith are hereby repealed and/or modified accordingly. SEC. 7. Separability Clause. If any part or provision of this Act shall be held unconstitutional or invalid, other provisions hereof which are not affected thereby shall continue to be in full force and effect. SEC. 8. Effectivity. This Act shall take effect fifteen (15) days after its publication in the Official Gazette or in a newspaper of general circulation.